My Whois Service is fixed. The American Registry for Internet Numbers (ARIN) released a fantastic new RESTful API which meant my old text parsing code (dependent on their old service) was broken for a couple weeks. Check out the new ARIN RESTful API and my service source code updates. In most cases The Same Origin Policy is desirable. It helps to prevent malicious code that could potentially reveal sensitive information from being run on arbitrary website. However, the same origin policy also makes it difficult to share resources within a common root domain, or run external widgets on your site (like displaying The Project Badge within your site). There are a couple ways to circumvent The Same Origin Policy, but I focus on JSONP and the document.domain property in this post. Note the callback=? at the end of the URI, in jQuery this indicates a JSONP call. How it works: the document.domain property contains the domain of the server from which the page was loaded. For example, the domain for http://adam.kahtava.com/ would be adam.kahtava.com whereas the domain for http://kahtava.com would be kahtava.com. The Same Origin Policy restricts resource access from kahtava.com to adam.kahtava.com unless we set the document.domain property to the root domain (in this case I'd want it set to kahtava.com to share resources with http://adam.kahtava.com). JSONP vs document.domain isn't a cut and dry comparison. JSONP lets anyone consume and share data, whereas overriding the document.domain lets you share resources within a common root domain. In simple cases where your only concern is sharing data within a single domain (exclusively on HTTP or exclusively on HTTPS), then overriding the domain works well, but in cases where you want to share or consume external data that may be passed over HTTP or HTTPS you'd probably want to stick with JSONP. The Project Badge makes use of JSONP so it can work on your website. Most of my publicly available web services also make use of JSONP through a WCF JSONPBehavior. The Project Badge displays your GitHub and Google Code projects in a badge that can be displayed on your site. This widget was built on the data being returned from my Open Source Service. View this post outside your RSS reader to see it in action or view it here. The source for the Project Badge can be found here and the source for the accompanying service can be found here. A list of all my publicly available web services can be found here. Add the following asset references, and a reference to jQuery (if you don't have one already). Set your project accounts (it's OK if you only use one host) then optionally set the appropriate filters - in my case my Google Code projects were prefixed with adamdotcom and I had duplicate projects on both GitHub and Google Code. By specifying remove:adamdotcom,remove:duplicate-items in my filters I filter out the duplicates and removed adamdotcom from the project name. 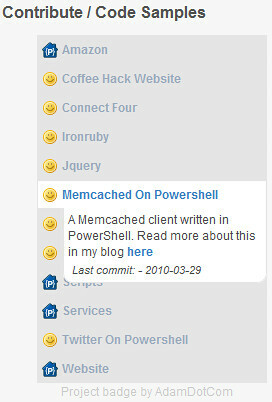 Add an element to your site or blog with the id of project-badge. If you have any issues, use the the working example as a reference, or send me a message. Say hello to the newest member of my service family; the Open Source Project Service. This service lets me (and you too my friends) grab our project details from either Google Code, or GitHub. If you have a project on GitHub or Google Code, you can retrieve your project details. View my sidebar widget that uses this service to display the latest updates from my source code repositories here. Contribute, view, or download this openly available source code here. This site now sports a Resume, Contact Me, Reviews, and Reading Lists section. These new sections make use of the services I created earlier - my resume content is pulled directly from LinkedIn via my Resume service, the Reading Lists and Reviews are being pulled from Amazon via my Amazon service, and I'm still working on a personalized greeting module which will make use of my Whois service. Now, when I update my resume on LinkedIn, add a new item to my Amazon wishlist, or write a new Review on Amazon the content is updated within this site and indexed by the Google. My next steps with this site are to: finish the greeting module, update the layout (drop the WordPress theme), and finish a Github / Google Code repo widget (kind of like this one) for the sidebar. Contribute, view, or download the openly available source code here. Services-services-services! Enough already! Today I introduce my Whois and Enhanced Whois Web Service. The Enhanced Whois web service lets me know where my visitor are geographically located, provides filtering capabilities, and can act on referrals. This will allow me (or you) to personalize site greetings, hide my email address (or content) based on the visitor, and provide a unique personal experience. Alternately I can use this service as a classic Whois service. We're not anonymous on the internet and IP addresses are what uniquely defines your internet existence. Whois services let us determine the registrant of internet resources. View your enhanced whois record. View your classic Whois record. So... why is this useful? This is the first step for this site's personalization - if I know where the user came from, where the user is geographically located, and have the capabilities to filter their Whois responses, then I can tailor my content to the user. For example: if someone from Google landed on my site I could mention that I'd love to work there and provide my email address and phone number, similarly if someone from Calgary landed on my site I could provide my public calendar of local events. The possibilities are endless. In my last post I mentioned that I was creating a couple web services that would hopefully bring together my online portfolio. Today I introduce my LinkedIn Resume Web Service. View your resume - retrieve your Resume by first and last name. Wow that was exciting, so now what? Well.. Head on over to my resume page. My resume is being pulled from LinkedIn through this very service. My online portfolio is increasingly scattered through the internet (reviews and wishlist are on Amazon, source code on github / Google Projects, resume on LinkedIn, and so on). I've been working on a couple services that will eventually pull my portfolio together while keeping a single point of reference, and... I'm sharing these services. Introducing my Amazon Web Service. View your Reviews - retrieve your Reviews by username or Amazon CustomerId. View your Wishlist - view your Wishlist by username or Amazon ListId. Head on over to my Reviews and Reading List pages. These pages make use of the data from this service. I should also mention that, this service was built on a previous iteration of my Amazon Web Service (How To Display Your Amazon Reviews and Wish List Using Amazon’s Web Services).